Are MDC Campers Any Good, Everything You Need To know. First impressions make a difference and MDC has several stylish camper models ranging from their standard soft floor campers right through to their Luxurious Touring Series range. When you’ve got something like the Robson XTT from MDC, you can be assured there will be a fair bit of camping comfort involved. MDC short for Market Direct Campers claim to be tested in Australia’s harshest conditions and to withstand every part of Australia, so we wanted to get down to the nitty-gritty of how these campers stack up, check out their manufacturing quality standards and see how the market has received this brand. We looked at how easy set up was and how much work was required from the time it took to hitch up, to the time we took out a refreshing beverage. I Bought A 2 Month Old MDC Camper Second-Hand Does The Warranty Still Apply? Why Choose A MDC Camper ? · Good value for money. This camper is an extremely popular model and it’s easy to see why with features such as full Independent trailing arm suspension with twin shock absorbers. This camper has many features the more expensive models include such as a Projecta 12V Charger a large family size MDC-12 tent & Full 12V Battery system with 100AH Battery. This lightweight unit features a black powder coated body, aluminium tool box and durable steel chassis. With a rough repayment plan of just $45 per week, this is an affordable and great value for money camper. The TBOX V7 Camper Trailer is the second in the range of soft floor options. It’s a light off-road unit with full independent trailing arm suspension with twin shock absorbers. One of the most functional features of the Tbox is the external sealed usable storage boxes on both sides. This camper also includes a fully enclosed family sized annex, functional external kitchen, Full 12V Battery system with 100AH Battery and Projecta 12V Charger. If you are looking for an affordable and robust entry Level rear fold off-road Camper with allot of trimmings to offer The Voyager RF really has it all! MDC provides a 5-year structural warranty and has included a full external stainless-steel kitchen with Dometic stove complimented by a generous annexe & a 12V Battery System with Projecta Charger. MDC recently released the new Expedition Series of Camper Trailers to keep up with market demands and this rear fold camper includes all of the best features such as independent trailing arm and suspension, a full-sized kitchen, Fridge slide, large living space, plenty of storage. You would think that with such a great price tag they compromise somewhere on components and manufacturing, but you are still getting the steel body and galvanized chassis. Suitable for 2 adults and 3 children this camper is also new to the fleet and part of the new Expedition Series of Camper Trailers. 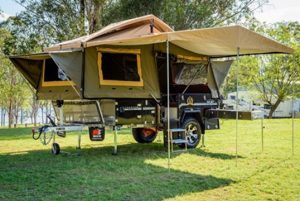 Some of this campers’ features include an aluminium toolbox, a full-sized kitchen, good storage and living space as well as independent trailing arm suspension. The Jackson FF is part of our Luxurious Touring Series of Camper Trailers. It is a hard floor camper trailer available with a Black or Silver gloss finish, independent trailing arm suspension and galvanized steel Chassis. The streamlined shape and rugged mud terrain tyres wrapped around alloys make The Jackson Forward Fold camper looks impressive. The rear of the camper is completed with twin spare and two rated recovery points with bow shackles. Reversing the camper is relatively easy thanks to the 2300mm extended drawbar. The added length also allows a large front box with multiple storage spaces. It hides a fridge slide, a smaller slide-out drawer and provides storage for the poles while another shelved section has a 12V point. Behind the stone guard, there is provisioning for two jerry cans and two 4kg LPG bottles that are plumbed to the rear of the camper. This camper has ample workspaces provided by a slide-out shelf for prep space and two drawers suitable for cutlery and other utensils. The slide-out stainless-steel kitchen contains a SMEV three burner stove and sink that is hooked up to the water tank via an electric pump. MDC have thought about power needs and there are Six external 12V points are spaced around the camper to plug external lighting into as there are none hardwired. A 12V point, 30A battery management system and volt/amp meters make a tidy power system. When the Jackson is fully set up it’s surprising to see just how much internal living space there are all 18 square metres in fact. The current package includes a portable toilet, gas hot water unit, annexe walls and en suite privacy room. A full queen-sized foam mattress is always appreciated and windows with midge proof screens mean you can sleep with the windows open on hot evenings. The U-shaped lounge seating area is a comfortable size. As with most forward-fold campers, there is very little storage under the lounge as it is taken up with a 1000W modified sine inverter, 240V battery charger, two 100AH batteries and radio, speakers. While the obvious sacrifice in the forward-fold design campers is storage space the concept of having seating and sleeping in the same space is excellent. Set up is quick ‘n’ easy as the gas strut assisted rack means there is no heavy lifting and winches assist to fold the roof back as you wind from the front. Packing back up was a bit more challenging. Two people would make this more manageable as you can’t let go the roof rack due to the gas struts that naturally want to pull it open again. The kitchen has ample lighting thanks to the well-placed LEDs. The stainless sell tops are functional and look very swanky, did we mention the drawers all have soft-close hinges! Two people can work in the kitchen as the work areas are split into two functional areas with hot and cold-water access, a four-burner Thetford stove, fridge space (No fridge is included in the price, but the slide will take up to an 80L Engel) and pantry and on one side a large food preparation counter. Ensuite comes standard with the supplied Porta Potti and Country Comfort instant hot water shower as well as the side walls to enclose the main awning with midge-proof screens plus a PVC floor creating a private well-protected camp. The Power package is a winner and MDC opted to use the Redarc BMS30 battery management system. The top-of-the-range unit looks after all charging and battery requirements, whether it’s 240V, solar input or DC-DC conversion to deliver the optimal voltage to your AGM batteries. Solar is a 120W panel permanently fixed to the boat loader/roof rack. The 1000W inverter and plenty of 12V outlets. There is plenty of storage in this camper and above all its solidly built. The construction is a hot-dipped galvanised drawbar and chassis with a zinc steel sheet body and quality components such as a DO35 hitch, a swing-away jockey wheel King springs and ROX shocks. All the canvas is 16oz. The Robson XTT is the newest model, marketed as the family-friendly camper trailer. The ROBSON XTT is a hybrid between the rugged 4WD camper trailers and XT caravan range. This 6 berth camper trailer boasts 2 comfortable double beds at either side of the trailer, with a comfortable and spacious internal club lounge and dining area that drops down and converts into another bed for an additional 2 adults. This camper has a easy to assemble concertina design and not short of any home comfort luxuarries such as 2 x 100 amp batteries, 2 water tanks (120L and 80L), an internal Kenwood sound system, boat rack, 120W solar panel, Smev 3 burner stove, a full annex and floor, external ensuite and shower with a 14L Truma hot water service, TV, independent suspension, pantry slide, 2 fridge sliders, tropical roof and more… Putting up the full awning and shower tent will add about 10 minutes to the set-up time. There is plenty of storage on the boat rack and a storage box up front. The fridge slide is capable of taking up to a 110-litre fridge. The electrical system consists of a Projecta 240-volt charger feeding twin 100Ah AGM batteries under the seats, while the 120-Watt solar panel on the boat rack is regulated by a Projecta IDC25. It can also be charged with an Anderson plug on the drawbar. The 240-volt wall socket under the table is powered up by a 1000-watt inverter. At the front is a McHitch 3500kg “Easy-Fit” automatic coupler. Its universal joint and spindle provide plenty of articulation and make it is easy to connect. It rides on independent suspension with twin shock absorbers, 12-inch brakes and 16-inch alloy wheels with 265/70r16 Goodride MT tyres. When you are buying a new camper there is an extensive list on the MDC website related to what is covered and what is not (Paint, Rust, Wheels and Tyres) so be sure to understand all inclusions and exclusions. However, when buying second hand the warranty is valid to the original purchaser only. 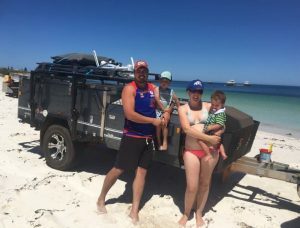 Transfer of vehicle warranty is not mandatory however there are some protections under Australian Consumer Law, some regarding the person that sold it to you and some via the manufacturer.